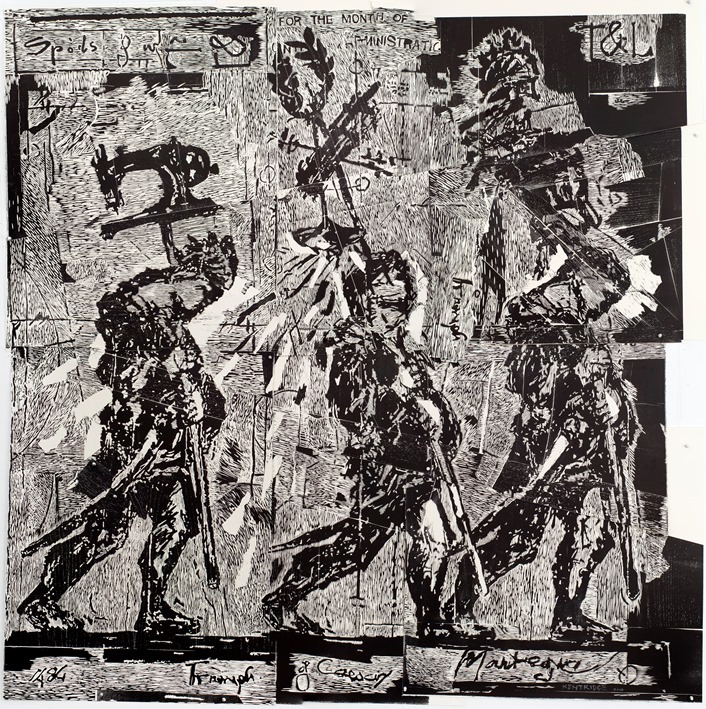 David Krut Projects is very pleased to introduce their newest collaboration with William Kentridge. In early 2016 William Kentridge was at work on a monumental frieze to be installed along the banks of Rome’s Tiber River in April of the same year. The 550 meter work would be stenciled onto the wall of the river from Ponte Sisto to Ponte Mazzini. It would be called Triumphs and Laments and would consist of scenes from the cultural and political history of Rome from drawings that Kentridge had been preparing in his studio in Johannesburg for a number of years. 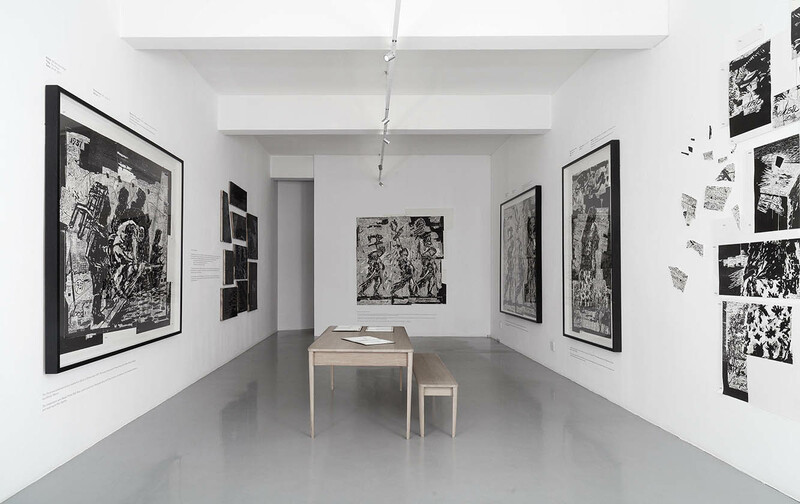 In January 2016 Kentridge also began discussions with a long-time collaborator, Master Printer Jillian Ross of David Krut Workshop (DKW), about using these drawings as the basis for a series of large woodcut prints. 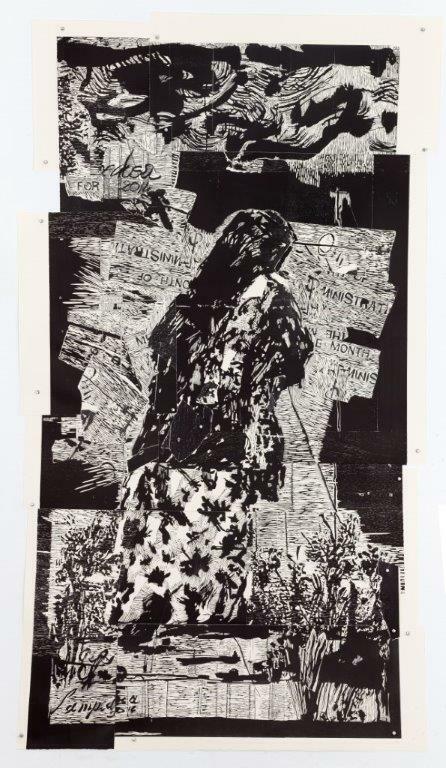 Ross and her assistants Sbongiseni Khulu and Chad Cordeiro began extensive tests on a grouping of three figures from the frieze as this would be their first woodcut project with Kentridge. Over the course of the year, the printing team worked on creating and editioning the first two woodcuts in the series, Mantegna and The Flood. February 2017 saw the completion of the third woodcut, Lampedusa, and work has begun on a fourth image. Mantegna is based on a group of nine paintings entitled the Triumphs of Caesar (1484–1492) by Andrea Mantegna (1431–1506). The sixth panel of the Mantegna series, Corselet Bearers, would form the main point of reference for the first woodcut in the Kentridge series. Mantegna was produced over eight weeks from 16 February to 4 April 2016. Whereas the drawing for Mantegna was based on a series of paintings, the image of The Flood draws its inspiration from a photograph found online of Romans seeking refuge from the devastating effects of the Tiber River flood that ravaged Rome in 1937. The Flood was produced over four months from 26 July to 28 November 2016. The image Kentridge chose as reference for Lampedusa was a photograph of a group of Eritrean widows taken during a memorial service held in Levinsky Park, Tel Aviv in 2013. The service was in memory of the victims of a shipwreck off the island of Lampedusa on October 3 of that same year. Lampedusa focuses on one widow with her face hidden. Lampedusa was produced over four weeks from 10 January to 7 February 2017. Each print is made from multiple blocks of wood, prepared from a variety of wood timbers, and printed on several sheets of paper that, when assembled, fit together like pieces of a puzzle. Some sheets were cut at sharp angles, others torn. 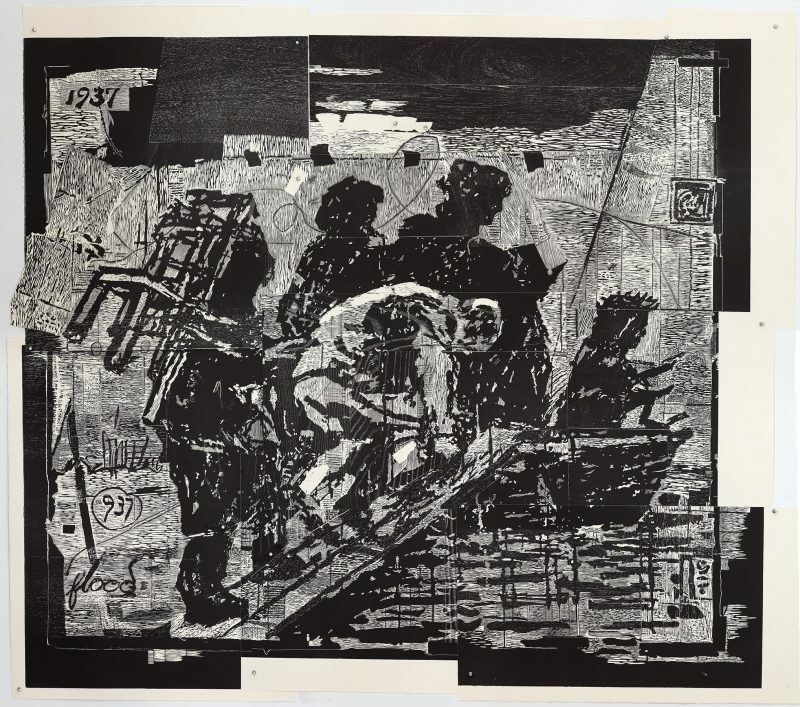 Pieces were also attached to the work by Kentridge in the last stages of production and allowed for overlaps of image and movement. Pins were used for the final assembly of the work and to ensure that each sheet rests correctly on top of the next. Guidelines were provided on a map made on acetate and in an instruction manual. Each print is an edition of 12. Each print comes unassembled. Main collaborators: Master Printer Jillian Ross, carvers and printers Sbongiseni Khulu and Chad Cordeiro, and wood expert Alan Epstein.